Lionel started using motor brush capacitors on their Pullmor Motors starting with the MPC era and continuing into the present day. These electronic devices you see on the brush plate are used to minimize the "noise" generated by the AC motor which can effect the proper operation of the “new” electronic sounds when operating the trains. This effort was largely successful but as in every fix, there is a drawback. In this case, the capacitors do have a limited shelf life. Engines may stop running if the capacitors fail or worse, someone trying to replace the brush cap may improperly replace the capacitors. It is best that operators unfamiliar with the inner workings of these trains have their trains serviced by professional service techs with the talent and equipment to properly trouble shoot such problems. Another cause for stoppage occurs when the battery life expires for those engines that have sound systems. This is especially true for MTH and Lionel. There have been many articles published in the toy train magazines addressing the issues of under voltage batteries. The fix for that is to replace the battery or recharge it. Most engines, steam and diesel, use an 8.4 Volt battery which can be purchased through a vendor who specializes in toy train equipment or through the manufacturer. However, the problem that some operators have with this situation is that they are not comfortable with the idea of going into the engine to remove and replace the battery. The solution to this is to replace the battery with a so called “super battery” that uses a small electronic circuit with a super capacitor unit, thus ending the dependence on a battery. There are two types of batteries and operators must know which one to purchase. You should also understand that once your old battery is replaced with a super battery, the engine must be left standing under power for one minute before operations commences. This does not have to be performed each time you operate the trains. This procedure should only be done when the trains have been stored for a period of time. As stated previously, if you have never taken and engine apart, please have your super battery installed by a trained repair person. For modern-era Lionel trains, those made from 1970 through today, parts information is available and free if you have access to a computer and the Internet. Lionel has illustrated parts listings called supplements on its website at www.lionel.com. From the site's home page, take the links to Customer Service and then Parts List & Pictorial Diagrams. These supplements include information for researching modern-era Lionel equipment. Download the PDF files for all 47 supplements from your computer. They cover a number of the Lionel products produced after 1970. Many of the trains produced prior to the '70's require more voltage to power the engines. Many of the older Lionel transformers are still good power producers and can be used after being serviced by a qualified repair person. Small transformers produced since 1970 do not provide the higher voltage needed for the older engines. Older Lionel power sources provide the voltage, of at least 18 volts, that can be expected from the older units. The output is indicated on the face plate of the transformer and also on the output panel where the terminals are located. The key is look for the potential output, usually 18 volts or more. Some can be found which produce up to 24 volts AC. Be sure to have the power cord replaced before using the units. Older transformers can usually be purchased at very reasonable prices. These can be found at train shows or on the Internet. Some have malfunctioning potentiometers. A good service person can evaluate these. Some cannot be fixed, but most can be repaired. Fourteen years ago, a friend gave me a No. 97 Coal Elevator that sounded worn out but still elevated coal. Seven years ago, I asked if you have No. 97 Overhaul Kits. You advised me to look for a younger No. 97. The advice would have been fine had I been able to find one at a younger price. After 14 years in my possession, the machine got so bad that it was popping the breaker. I took it to the bench, turned it upside down, and noticed that a gear shaft ran through a hole in a sheet metal tab. I powered it up and the No. 97 made an awful noise. I gripped the tab with a small pliers and very very slowly bent it, thus displacing the hole, thus displacing the shaft, thus displacing the gear interfaces. I figured that if the noise got worse, I would move the pliers the other way. But in a few moments, the 97 was purring like a kitten and the buckets moved with alacrity at a modest voltage. It's embarrassing to be preaching to the teacher but I feel compelled to share my stroke of good luck since this is a subject on which we have corresponded in the past. We often get calls for replacement outer Boiler Front Ring assemblies. Unfortunately, the outer ring castings are not available separately for postwar and prewar steamers. These were never sold from the Lionel Corp. and the repros are not an exact match for the original boiler front doors. This means that you must replace the entire front assembly when the original breaks. Originals are very hard to find in good condition and we have paid as much as $100.00 for an early 726 replacement. The repros are quite acceptable, however, and I usually recommend that you purchase a repro until you can find an original, which can take some time. Replacing the marker lanterns on the outer rings is not a practical solution for those who might want to try this. After at least 35 years with no Lionel type Smoke Pellets, a fellow from Texas took a look at the situation, saw a need, and went into the Smoke Pill business. For a time, we could get some similar pills from K-Line but those finally disappeared from the market a few years back. Most of us used the Liquid Smoke Conversion Kits which, when installed, produces the smoke as well as the pills. The Conversion Kit provides you with a nylon chamber cover which must be produced in hi-temp nylon plastic. The covers from Lionel in white plastic were better than the later black molded covers. We have found that if the black repro nylon covers are used to convert the pill type to liquid, the heater element must be installed well below the plastic surface. Otherwise the cap will overheat, distort and possibly malfunction, under some conditions. We have installed thousands of the Liquid Conversion Kits, and the liquid approach does seem to work very well. However, some prefer the old pill type system which works equally well. Now that pills are available, it's nice to have the option to use them. This has resulted in many requests for a return to the pill type heater element which uses the metal chamber cover. Parts to make either repair are available from Dr. Tinker. Consult our Parts List and the Repair & Operating Manual for parts descriptions, numbers, prices and assembly instructions for details. A number of you have asked about the Lionel Bulletins from 1945/1946, which explained what the Flying Shoe design was all about. These sheets are now available from Dr. Tinker for $5.00 per set. We have assembled what we could find and printed them for distribution. 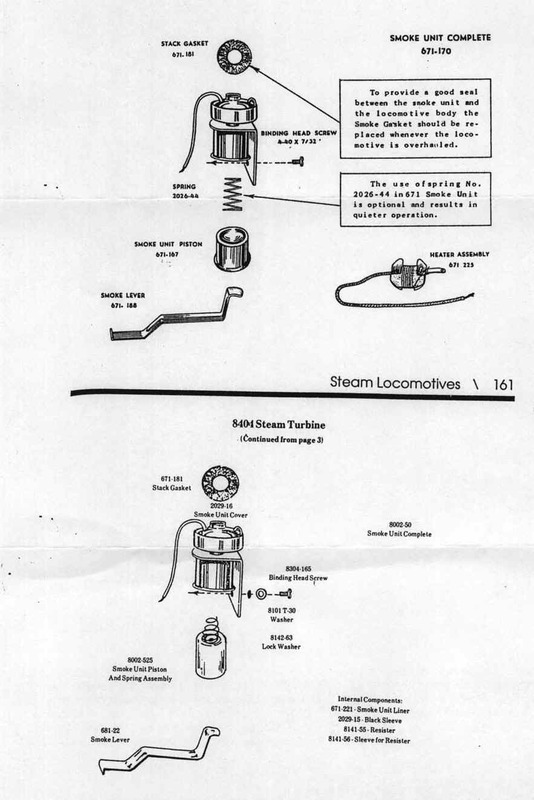 You can find exploded diagrams, parts lists and supplements online at www.lionel.com. Click on "Customer Service", then "Parts List and Exploded Diagrams", and type in the product number. II. Slide the white fiberglass wick #8141-56 over the resistor #8141-55. III. Put the shrink tube #2029-15 over one lead and heat-shrink close to the resistor body. IV. Carefully bend both leads 90º close to the resistor body. Insert the leads through the holes in the black cap #2029-16. The insulated lead goes in the larger hole. V. Put the new fiberglass liner #671-212 in the smoke pot and seat the cap and heater assembly in the pot. The resistor must not touch the air spout. Early 671 and 675 pots are smaller. In this case, the cap fits outside the smoke housing and you will need to clip the internal "fins" to allow proper seating of the cap. VII. Now connect the ground lead to a convenient place. You can solder this lead to the smoke housing itself, or you could solder a lug to it and attach it to the locomotive frame with a nearby screw (Example - smoke unit support screw). VIII. Finally, place the felt smoke gasket #671-181 or alternate #726-57 on the top of the smoke unit before inserting motor and smoke unit assembly into cab. This gasket prevents smoke fluid leakage and further insulates the hot lead from the locomotive body. The best info comes from first hand, real life experiences when it comes to repairing old Lionel Trains. All of my notes and letters, going back to the material written for "O" Gauge Railroading Magazine were generated out of necessity and that kind of thing continues to develop on a daily basis. Here is another one that has been a bit of a mystery to me for years. A phone call from a fellow about the 681 Smoke Lever prompted me to look into the design situation, after years of wonder, actually. I knew that the 671 (Late Model) Smoke Lever was different from the 681 but I never sorted out why. Here then is the story as it unfolded for my caller and me. When Lionel decided to install "Magnetraction" in the 671 a few modifications were necessary, which affected the Lever shape. I always wondered why the Smoke Lever tended to stay assembled to the Chassis on the 681, whereas it was easily removable on the 671. In other words, the Smoke Lever simply would not come out unless a few things were done to facilitate removal. Unlike the 671, the 681 has "Magnetraction" plates mounted on both sides of the Chassis, which carries the magnetic force to all eight drivers. The magnet is held in place by a fiber piece and tabs. Removal of the Smoke Lever is not possible until the magnet retainer tabs are bent up, the fibre removed and finally the magnet. Turns out that in order for the Smoke Lever to work properly on the 681, the tab on the cam end had to be bent down instead of up. It's a little different from the 671 concept, but the end result is that the lever keeps the piston moving up and down to pump the smoke out, the same way, via the cam on the axle. So now we know why the 681 Smoke Lever has the tab bent down, while the 671-188 has the end tab pointing up. Received the 671 Steam Turbine yesterday in the single box and it was loosely packed, but not broken fortunately. I am taking this opportunity to point out how risky it is to pack an Engine loose in a single box in this manner. Ninety percent of the damage that we see comes from improper packing for shipment. Trains that originally needed a little or no serious repair work end up as parts engines as a result of the damage sustained in transit to us. This may seem like a small matter at the onset, but please let me assure you, this is a major problem for us, which means it's a problem for you and your customer as well. When I have gone through this one and returned it to you, please make a note of how we double box it for the return shipment. The secret to successful packing is two fold. First, the Engine should be packed tightly in an inside box so that it does not move or rattle. Secondly, this box should then be packed tightly in an outer shipping box. Allow one to two inches all around the inner box and pack it tightly so it cannot move around during its travel. I use balled up newspaper, foam particles and even balled up plastic grocery store shopping bags. I hope this info will be of value when you send the next Trains for repair. Postwar Lionel Twin Motor Engines like the FM, F3 and GG-1 present a special problem to the repair person. These Double Motor Engines must be uniquely coordinated for trouble free long term performance. When servicing these engines, both motors should be dealt with at the same time, in the same manner. In other words, if you replace the Motor Brushes in one, you should do this to both motors at the same time. The reason for this has to do with balance. If one motor is pulling better than the other motor, this imbalance will eventually work a hardship on the slower motor and the better motor will actually have to work harder than necessary in order to compensate for the weaker one. Performance of both motors will eventually be reduced, if one is serviced and one is not. Always clean and lube both motors in the same way so one will not have an advantage over the other. These circuit boards are now available from Dr. Tinker at $5.00 plus shipping, while supplies last. Click here for more information. Just like the old ones @ $15.00 per bottle plus shipping and handling ($9.00) by popular demand. Make check payable to D. Laughridge. Most would agree that Lionel's lowest moment was when, for financial reasons, they developed the Scout Steamers with those awful plastic motors. Many say these were "throw away" motors and they may have been planned that way. However, the exploded views of these ill-fated assemblies are clearly documented in the Repair and Operating Manuals, and the parts that wear out are now available, including the brushes and springs. Dr. Tinker has a limited supply in stock, if parts are needed for repairing these poor little motors. Please use the appropriate part number and word description when ordering. Brushes and springs average $2.50 a pair. Dr. Tinker stocks all the lubricant you will need for servicing your Lionel trains, including Lubriplate and LaBelle, plastic gear compatible products. Call 781-862-5798 for details. Can you tell me if there is a "special" tool to remove the horseshoe washers so that you do not harm the car? If there is, where can I get one? I have never needed any special tool to remove the horseshoe washers. A pair of small household pliers works fine for me. I do insert a piece of thin card stock under the ends of the horseshoe so as not to scratch the floor of the car. I hope this helps you a little. I was talking with a long time train repair associate about a 1947 vintage 726 Berk I was running on his layout and how I had tried everything to get the E-unit to work properly. It seemed that the plunger had become magnetized and was sticking in the up position. The reverse unit was in very good condition and I wanted to fix it. He asked me if the 1946 version of the Berk had a horizontal E-unit. I replied "yes" and he continued doesn't it have a return spring? I replied "yes". He continued, why wouldn't a spring like the 164-16 on the Berk rear truck work to give the plunger a little extra boost to return to the down position when the power is interrupted between cycles? So with a little experimentation I was able to get it to work. You have to clip about three coils off of the small end so the plunger isn't over powered at low voltage, but it seems to work very well. It seems like trying to demagnetize the plunger would work for a while but the problem could reoccur. I'm sure you've tried this fix but I thought I would pass it on anyway. So now you have helped a fellow train person, and the joy from that is in your pay! Yes, we have tried the spring and it does seem to be a solution, among many. Thanks for passing this hint along. I'll try to insert it in the Web pages if I can get a break here. I have a problem with the "new" plastic MPC/LTI couplers. They won't stay closed. I ordered new armatures, the ones with the metal thumbtack, but they break very easily when I try to install them. Is this normal? What are they (Lionel) doing to make the couplers so frustrating? I bought coupler armatures from several different parts dealers, and got some directly from Lionel. The only ones that really worked were the ones I got from Lionel. Can you offer any insight on this continuing problem? I miss the old postwar design. We have all experienced the problem you mention, with the replacement # 9050 series Nylon Coupler parts. There are a number of forces at work on this, which should be considered. First, we do not have a high regard for the design concept, but have resigned to try to make the best of what seems to be a flawed concept. That said, beginning with the products that came out through the 70's, those seemed to work marginally. Memos from the factory showed us how to bend the Nylon Plunger, AKA "Armature", so it would work better which suggests that there were problems from the onset. And now, in the new scheme of things, products from the Orient, in the year 2002, by and large, don't have this type of plastic assembly. But that doesn't help us on the # 9050 Plunger replacements. You are correct. The Lionel Plungers seem to fit and work fine, even though I have had a few, purchased from the Michigan plant, that were brittle. Early parts went into the two guide holes with no problem, but Plungers made from the brittle plastic will break when forced into place, if not pressed straight in. The harder plastic (Nylon?) part has better springiness, but the trade off is that they break easily when improperly inserted. With practice, you will develop a technique for installing the replacements. However, the problem gets more complex when the look-a-likes from K-Line get into the picture. Frankly, if you should get some of those from a parts dealer, save them for K-Line truck repairs, exclusively. Some guys have told me they can make the K-Line parts work in Lionel trucks, but I have had poor luck with them. We long for the good old days, when parts could be interchanged, every time, without surprises. There was a time when production standards and consistency ruled. That still is in there somewhere but just where is hazy, in 2002. If you get any of the Plungers that don't snap right into place, chances are you have a non-Lionel part that looks correct, but isn't. I sympathize with you on this. We have all struggled with these crazy variations for the past 25 years, or so, and now it looks like we can expect more of the same with parts and trains being produced all over the planet. This is why I prefer to stick with the good stuff that was produced on. US. soil. If you have Lionel questions, email Dr.Tinker at dave@drtinkertrains.com for a timely reply. Have you ever wondered why the electrical cord on your appliances now have the three prong plugs? The later appliances approved by the Underwriters Laboratories with the ground plug, appeared on our gadgets a few decades ago. Notice that Lionel Transformers produced prior to 1970 had only two 110V plugs. When MPC, General Mills, took over Lionel, all transformers grew another plug at the insistence of the UL. Some operators who have large layouts requiring multiple transformers, have requested power cords with the ground plug. This makes sense because when more than one transformer is added, the grounds need to be aligned, starting at the wall plug and proceeding all the way to the track voltage. The addition of a third prong allows the transformers to be utilized with common grounds from the start. Recently, a fellow who is in the utility business, asked why his Lionel TW Transformer showed a low voltage at the tracks when his power is plugged in, but not given any throttle. Checking our own TW at the shop, sure enough, there was a small indication of voltage at the track under these conditions. When an engine was placed on the track, the voltage disappeared. I had always known of the existence of the so called "leak" but never gave it much thought. From what I have learned, the small temporary leak is an Electromagnet Force Field (EMF) condition, generated from the interaction of the transformer coils and field as the device converts the 110 Volt wall current to the lower track voltage, required for Lionel Train AC operation. The UL engineers apparently did not like this condition and insisted on a few restrictions, not always producing benefits. Transformers produced for Lionel Trains were never as reliable as those produced at the Lionel factory in Hillside, NJ. Generally speaking, the consensus is that the transformers produced after 1970 are simply too sensitive to the conditions that occur when powering up the locomotives. The addition of the third plug is probably the only good result of so much attention to modern Lionel transformer production. Most people agree that the Postwar transformers are more reliable than those produced after 1970. The ZW, most famous of all Lionel power sources, are extremely popular and reliable. These are readily repairable if serviced by qualified service people. A third ground power cord can be added, if done by an established service person. It's important to know your repair person and to make sure he is knowledgeable in this area. Adding a properly installed ground plug will at least provide a guarantee that when using multiple transformers, they will be aligned with common grounds. It is recommended that the "U" ground posts be all "jumped" together to insure this continuity, in addition to adding the common grounding plug. The other advantage is that you will get rid of the voltage leak at the track. This has not been a problem, to my knowledge, for over 100 years of Lionel Train operation. But perhaps it is a worth while addition to those wonderful Transformers. Most importantly, adding common ground plugs insure that ZW's, when used in tandem, will always be able to perform without voltage problems due to mixed grounding. Since you spent your life in the play time enhancement business and served as master of ceremonies at the Lionel Corp., I am sharing a few thoughts and observations that you may find entertaining. I am sending copies to the chief execs. at Lionel and MTH as ideas for advancing the state of the art, while preventing design and manufacturing errors, and making equipment user repairable. A friend sent me Richard Kughn's version of the Rock Island Northern. It ran well but the appearance is so disgusting that Mr. Kughn owes an apology to the Rock Island Technical Society. I spent my youth trackside admiring those handsome machines. The same person sent me 7 new locomotives to run. I was the first person to remove them from their boxes. In addition, I purchased 2 new modern (non-traditional) locomotives. The 9 locomotives were a mix of K-Line, Lionel, and MTH. The new ones were substituted for assorted locomotives already on layout and subjected to the same degree of use as the aged power they were replacing. Of the 9 new locomotives, 6 were plagued with design flaws that surfaced immediately. One developed cracked carbody, apparently due to uneven mold cooling. Another lost its sound system. Only the RailKing Turbine survived its tour of duty without trouble. Maximum tour of duty was one yr. This is not a good record considering that my ancient fleet dates back to the decade immediately following WW II and its constituents run for years without attention. Given the sophistry for which the non-traditionalists are striving, I suggest they study the Military Standards pertaining to quality, reliability, MAINTAINABILITY, trade-off analysis, and durability. Maintainability is emphasized because today's hobbyists are accustomed to doing their own repair work. The list of "Mill-Stds" should be available from the Secretary of Defense or Superintendent of Documents at the U.S. Govt. Printing Off. The documents are clearly written and intended to be applied as appropriate. I insist on the re-introduction of magne-traction. Traction tires gum up rail heads and place undo stress on electrical and mechanical components. My Jeep manual says not to use four-wheel drive on dry pavement. Equipment needs room to breathe. MTH traction tires are notorious for falling off before they wear out. Judging from my observations at Horse Shoe Curve, 2 giant Greenberg shows, and the four-and-a-half yr. old boy who came to see my layout (and ended up helping me run it), I see no need for Thomas the Tank, the Polar Express, Henry Pothead, and assorted holiday trappings. The idea is to take an industry that is so aesthetically appealing, operates in the open, and reduce it in size so it can be brought into the house. The peripheral rubbish reminds me of Lee Iacocca rebuking Detroit for pumping out so many variations of the same vehicle. I have a feeling that the retired automaker would counsel the Big Two to reduce their variety and make longer production runs of remaining product types - and reduce catalogs to the annual 50 page wish book. I am an old man. The only thing I desire, which corresponds to the only space available, is another box coupler consist. That stuff is actually cute and performs basic railroad functions. And if it goes haywire, I can fix it myself; I don't have to take it to a psychiatrist. But I hope reading this rhapsody was note a waste of time for the Big Wheels. Time marches on, whether I do or not. A customer call to a local train store in regard to a pre MPC/LTI transformer like the RW and others, produced a revealing perspective on how shops that want to sell new trains, view the business. Transformers produced since 1970 have lacked the higher output needed for the older trains, which require as much as 18 Volts, and more, to function properly. The only way one can hope to power many of the Prewar trains is by means of an old reliable 18 plus Volt output capability transformer. These could be found new up to around 1970. Now, one has to find good repairable transformers at shops selling used trains, at train shows or on the Internet. The store clerk had asked the customer why anyone would want one of these "old pieces of junk", pretending possibly, not to be aware of the deficiencies of the new, post 70's power units, in hopes of selling a new transformer to the caller. It follows, for those with older trains, that it is important to look for transformers with the higher output markings. The output is always clearly marked on the dial on the older units. You can find them with 18 Volt output, up to 24 Volts. And these Units are not usually expensive. Many need to be serviced by a qualified repair person. Qualified is the key word in this regard, as there are many imposters out there. A word of caution: Transformers with the Prewar cloth wrapped power cords should not be used. Look for units with Variable Voltage Rheostats and rubber or synthetic rubber sheathed power cords and molded plugs. That's a good way to ID the better equipment. If you have any doubts about a piece, feel free to call for help in purchasing older transformers. There is some "junk" that you will come across, but there is also plenty of good stuff to pick from. The old adage, buyer beware is very good advice. A fellow brought a new broken imported Tender to me at a recent Train Show for repair and service. The Tender was very heavy, I noticed. The cast truck frame was broken and the fellow wanted a replacement of the truck frame. The company does not sell the parts for these but they are pretty good about replacing broken parts, if the proper procedures are followed. I suggested he call or write Lionel to see what they would do for this car. At this point, having built a number of layouts in my life, I must say that the old reliable Tinplate "O" Gauge Steel Track wins my vote even though it is not at all realistic. Lionel Super "O" is good also, and much more realistic, but the track is no longer produced by Lionel and the switches do wear out. GarGraves looks good and works best for large layouts. Lionel FasTrack looks odd to me with the bright center rail and undersized cross ties. FasTrack won't let your Lionel Postwar "magnetrac" engines function because of the metal used for the rails. Ross makes the best switches these days, but old Lionel O-22 are quite bulletproof. However, they are not very scale-like. Atlas Track is handsome except the rails are quite squarish on top and tend to chisel away at the MPC Fast Angle Wheels on freight cars. With so many choices, it's difficult to select what's best when building a layout. My next layout will use GarGraves with Ross Switches. I hope to build it in Maine at our new house, when the time comes. Lionel could have made a big hit, I believe, if they had rerun the Super "O" Track. And, I believe there is still room in the market for a mass produced track like Lionel's FasTrack with more acceptable cross ties and blackened center rail made of magnetic friendly metal. One has to wonder why the manufacturers go to such lengths to produce inappropriate products, only later to find out that there are many of us who could have suggested more desirable and marketable products. Remember when Y2K was a big deal? Now, we are nonchalant about numbers like 2008, 2010 and even 2020! One gets much more conscious of time passing after the age of 70, and we want to place greater values on how we spend our time. After 70, it's all quality time. And we hope for good health, comfortable rest and minimum financial worries. Of course, we don't live in a perfect world but it's nice to pursue the idea. Perfection has always been a goal for me. My parents instilled it in me, somehow, and I do appreciate that. We assume others feel the same way, but obviously all don't view "perfect" the same. The cloud created by our ventures in the Middle East skews our perspective lately. Our belief that we are dependant on fossil fuels for survival has forced us into an uneasy position. Clearly, we need to reevaluate our priorities in this new century. The sooner we do this, the sooner we can expect an improvement in our lives, now and for the future. It's time to change the ways we power our perfection. From time to time we break away from the mail order parts business and repair work to do a little writing. This is one of my favorite exercises, actually, and since we stopped publishing the articles in OGR and CTT, and the “Coupler” Newsletter, a great big void has existed in my life. For this reason, I am always looking for a few minutes to jot something down that might be of interest to others who enjoy fixing up old Lionels. Initially, we felt that having a nice website would help people decide whether or not to have their old trains serviced. Also, knowing just how to order replacement parts is a discipline in itself, so this area is covered here as well. However, the chance to communicate with others on this facet of the hobby is the fun part of having a website even though maintaining it requires some effort. This year, we hope to spend more time on commentary and repair hints, especially regarding the postwar Lionels. This seems to be the area of most interest to our friends out there. Trains produced after 1990 have become somewhat complex, so we tend to concentrate on U.S. made Lionel trains in this effort. Thanks for allowing us to ramble on a bit about our experience in train repair over the past years. When we were young, the 'tall' ones told us when to slow down. When the demands of the world became too great, their powers of reasoning proved maddeningly accurate. 'I think someone's tired,' they observed. And off for a nap we went. Ten minutes later, our dreaming faces had put us back in good favor with our exasperated parents. When we woke, the word somehow made sense again. What kind of truth might a napping child impart to us? Now we are the tall ones, living in a complicated world with no one to tell us when to slow down. The slumbering little one knows the value of not having the last word, or accepting a minor defeat. It's so simple. Miss out on something. Put yourself back in your own good favor. The world will wait. As a train repairman, I often give thanks in my private way, to Bruce Greenberg and Maury Klein, who were both responsible for publishing the Lionel Service Station Sheets that we all use daily. Without these handy reference books, we would not be able to communicate with parts dealers or each other. The Greenberg Repair and Operating Manual, 1945-1969, is most often seen in soft back form @ $21.95, #10-8160, 7th Edition, and is the most readily available book that we use and sell, actually. Following that, Lionel fortunately published their own up to date book in similar form in around 1978, in cooperation with Kalmbach and Dr. Greenberg. This covers Modern Era material produced from 1977 through 1992, #10-7785 @ $29.95, now, sadly, out of print. The powers that be at Kalmbach do not feel that this book will sell and have elected not to reissue it. I have written many times to Kalmbach to plead with them to reverse their decision but so far, I have had no luck. Without this information, repair work is greatly compromised, obviously. Lionel seems preoccupied with new train sales and catalogs rather than with repair matters. I have often suggested that while our hobby is made up of Operators, Collectors and Repair People, Lionel's, and consequently Kalmbach's, interest deny that repair work is a significant part of the hobby. Yet, they continue to publish magazine repair articles that clearly contrasts with this theory and obviously parts dealers continue to flourish because the idea of fixable trains make a lot of sense to most people. It is my hope that eventually, Lionel or Kalmbach, or both, will wake up and do something about this information gap. I have suggested that a good reissue of the Modern Era Book would include only the Lionel material, to make the book a little more manageable. But this has not produced a response to date. The fact is that much of the information not covered in the 1945-1969 Book is found in the 1977-1992 Modern Era Book! That's how I was able to sort out the 671/681 Smoke Lever situation, in fact. The need for a reissue of a smaller version of the Modern Era Book is clearly obvious to us here at Dr. Tinker's shop. I urge anyone that reads this to contact Lionel or Kalmbach in this regard. We don't want the next generation of train hobbyists to be cheated out of all this great activity, which is such a large part of "The World's Greatest Hobby", Kalmbach's own coined phrase. We have to let the publishers know what we want and need. The reference books are just as important as a screw driver or a soldering iron, and probably more so. I urge you to take a minute to contact Lionel about our need for information. The supplements to date are available from Lionel via their Website, but a handy reference book is like a tool at your work bench. Won't you join us in this all important campaign? A reissue of the Modern Era Book will sell big time, I believe. Trains, like everything else that Americans consume, are produced off shore these days. That means, to a large extent, that these are also designed outside of the Michigan facility, which is now apparently a warehousing facility at best, with administration personnel, of course. This change means that traditional Lionel/US engineering methods are not always evident in the way the trains are produced, of necessity. This is not to say that the products are inferior, though some will argue this point. But when it comes to repair and replacement parts, we hit a snag. Lionel has not worked out just how to proceed in this area, but they are hopefully trying to sort things out. For over fifty years, Lionel Service Stations provided consumer support to the train market, all over the world, actually. That system still survives but access to the parts is an ongoing problem. We have noted that technical drawings and exploded views of recently produced products are being generated by Lionel. These can be seen on the Lionel Website. We have downloaded the Supplements as they become available. While the work is impressive, the follow through from Lionel is not always forth coming when it comes to part availability. Parts numbers are not always easy to determine but it basically is still possible to sort it out if one can establish when a product was produced, by year. The next step is to scan the exploded views in the normal manner to locate the part, seek out it's number and then go to Lionel for the part availability. This can get tedious, admittedly, but generally we have been able to speak to technicians regarding the parts we need on the new items. This may take a little time to do but in the end, it's pretty much the only choice we have, as we see it. In the past, Service Stations had the parts in stock or could get them from the factory in a week to ten days. Now, it takes a little more time because of the complexity of the situation and also because there are so many products going out to the public, which invariably break and must be fixed. We are encouraged by what we have seen from Lionel over the past few years in this area. Service is the secret of business success, we believe, and we hope to see more of this sort of commitment from our friends in Michigan. We will keep you posted as things develop, regarding parts availability for Lionel repair work. Many of you younger train people have a great hunger to experience the Lionel Train adventure. Some want to build a layout and run the trains, while others enjoy collecting. Some want to do both, sooner or later. Regardless, one aspect that ties the Lionel scene together is the repair, servicing and maintenance of the trains. The repair segment does not lend itself to everyone, but it is a huge part of the hobby and is often overlooked by the manufacturers, especially nowadays, with all the importing going on. The ease with which one can go into a shop and purchase almost anything is mind boggling. However, there is a tradition of keeping the trains running that is being overlooked by many in the hobby. Some of us enjoy working on the trains, almost as much as owning or operating them. For example, in my case, many assume that I am a collector automatically. Nothing could be further from the facts, however. The only reason I acquire trains is for a customer or for reference. I often tell people that I’ve had just about everything Lionel ever built at one time or another. I’m not about to stop being inquisitive, but accumulating things has never been high on my list. I crave train knowledge. Understanding how it works is my thing. So, we continue to build our inventory of train parts for repair jobs, but not the trains themselves. Many of the new trains, since around 1990, have not seemed to be readily repairable to many of us, and getting the parts to fix them is not easy. For this reason we have elected to concentrate on the trains from our time, which is basically trains produced from around 1930 to 1980. This includes some Prewar trains, some Postwar trains and “Modern Era” trains, produced up until importing got into full swing at Lionel. This is the period that we are most familiar with and therefore it’s the area we are happy working with. The “repairable” trains are of great interest to most people. It is indeed unfortunate that the manufacturers, marketers, and the publishers of related current production train equipment and materials do not recognize this fact. To ignore the Lionel traditions, of servicing and repairing trains is understandable, but not wise. In my view, it shows a lack of understanding on the part of the new marketing people. It may be a fine way to generate money, but it does not do much for the longevity of the hobby. It is reassuring, however, to see that Lionel has finally produced the #45 repair supplement for those who wish to repair some of the newer trains. The supplements encompass about 30 years of train production, which takes us from the MPC period (early 1970’s) up to the Import period, which is now. Where the hobby goes from here is anybody’s guess, but I think repair people will always be interested in how the trains work and how they can be fixed when they break.